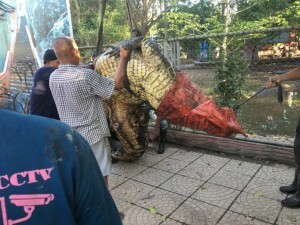 A giant reptile whose escape from a flooded southern zoo sparked an anxious croc-hunt was back in her enclosure Monday. Four days after she swam to liberty from the Tha Lad Zoo in Nakhon Si Thammarat province, Nadia was tracked down Saturday when the crocodile-hunting team assembled to find her spotted her lying low in the zoo’s flooded deer exhibit. No deer were present at the time. The 5-meter crocodile had slipped out on Wednesday when the flooding crisis, now blamed for the deaths of at least 43 people, left the zoo underwater. Officials feared she had escaped into residential areas. A team of zookeepers, local fishermen and fishery officials used a crane and their combined manpower to lift the Indian-born Nadia from the flooded deer exhibit and haul her back to the crocodile enclosure. While finding Nadia was a relief, local residents remain on alert since the zoo’s other, smaller crocs, which range from one to two meters, remain on the loose. The crocodiles may try to harm people, officials said, if they cannot find food in the floodwaters and reach the point of starvation.